A simple, two parabolic band model is shown to give the correct bandgap scaling, dispersion, and magnitude of bound electronic optical nonlinearities in semiconductors and certain large gap dielectrics. 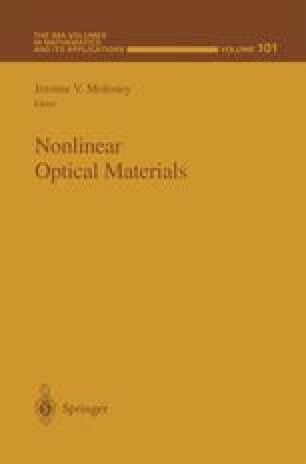 Essential to this formalism is a generalized Kramers-Kronig transformation that unifies the optical Kerr effect (n 2) with third-order absorptive nonlinearities: two-photon absorption, Raman effect, and quadratic Stark effect. Experimental results obtained with semiconductors and dielectrics have energy band-gaps ranging from 0.7 to 11eV show remarkable agreement with this simple theory. Extensions of t his model successfully predict the nondegenerate optical Kerr effect and nonlinearities in active semiconductors.